Good morning! Don’t you love that it’s almost the weekend again? I hope everyone had a great July 4th! I’m sure many of you enjoyed some great barbecue and burgers yesterday. 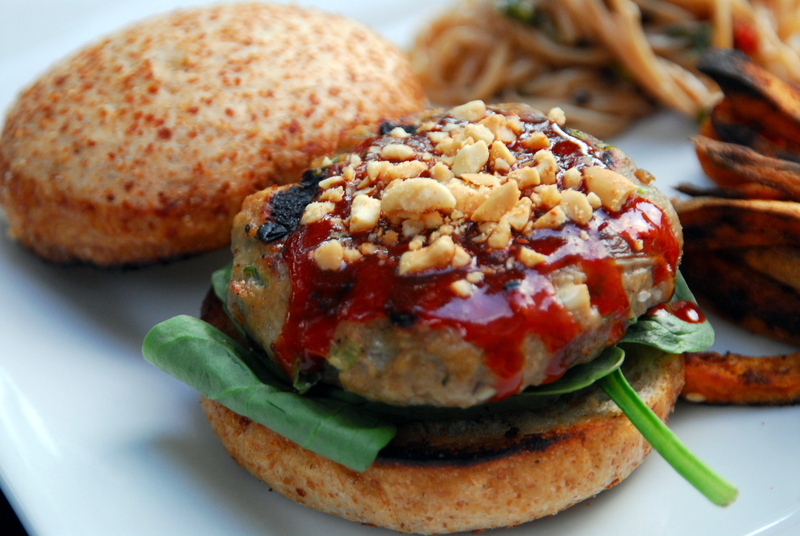 Over here, we put a twist on your typical fourth of July burger and made these delicious Asian Turkey Burgers! I know I’ve said this before, but I really have come to prefer both veggie and turkey burgers over regular beef burgers. They’re just so much more fun and packed with so much flavor (well, if you make them like I do!). This particular recipe is actually Luke’s concoction. He’s made these a couple times and I was finally able to write down the ingredients and photograph the process so I could share the recipe! The burgers themselves are amazing, but I really think the secret ingredient that gives them their pizazz is the go-chu-jang sauce (Annie Chun makes a great one and you can find it in the Asian section at almost any grocery store). Lately, we’ve been using it on everything when we make asian dishes. Luke was clever and decided to use it in place of ketchup on top of the burger. Genius! I think the only thing that could make these burgers better is a homemade sesame burger bun. Next time! First, chop up the scallions, mushrooms and garlic. 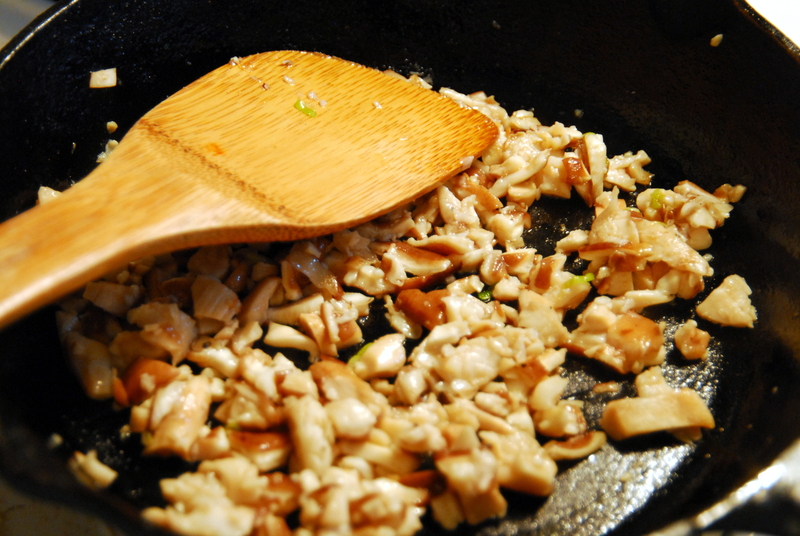 Add the sesame oil to a skillet over medium heat and add the mushrooms. Saute for about 2 minutes, then add the garlic and saute for another minute, stirring constantly. 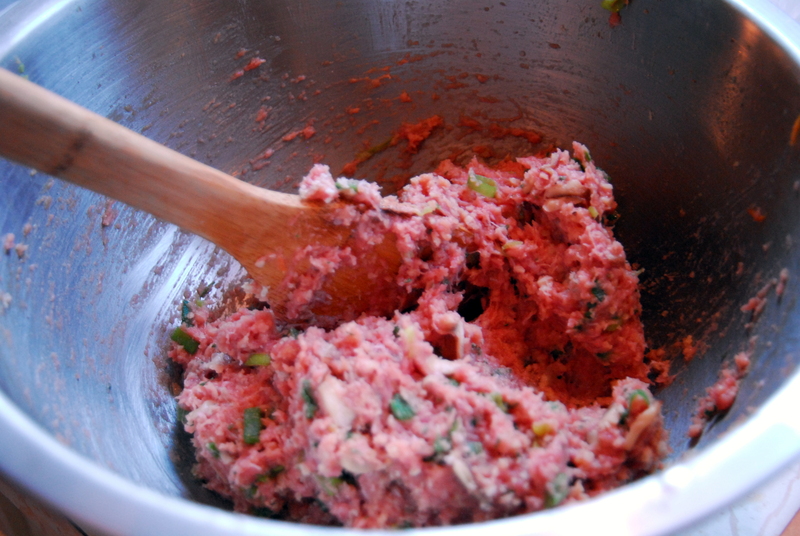 Then add all of the ingredients except the spinach, buns and go-chu-jang sauce to a large bowl and stir to combine. 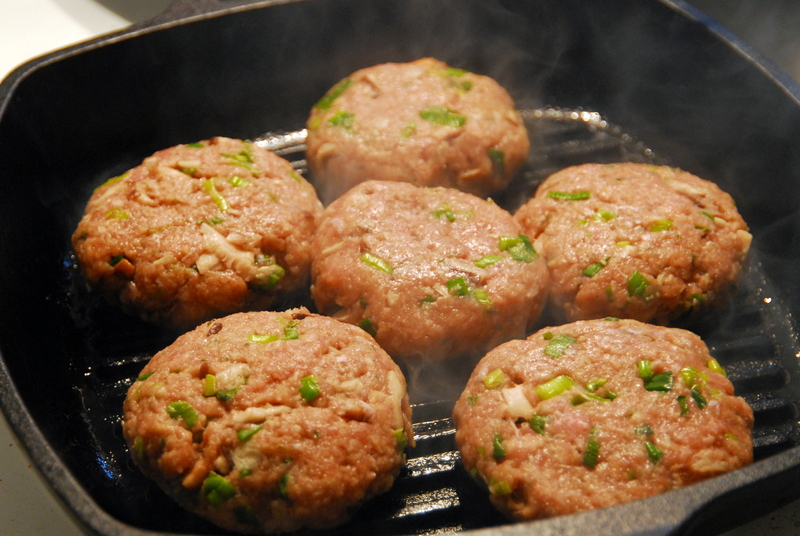 Heat an oiled grill pan or grill to medium high heat and form your patties. Cook for about 5 minutes on each side, until cooked through. 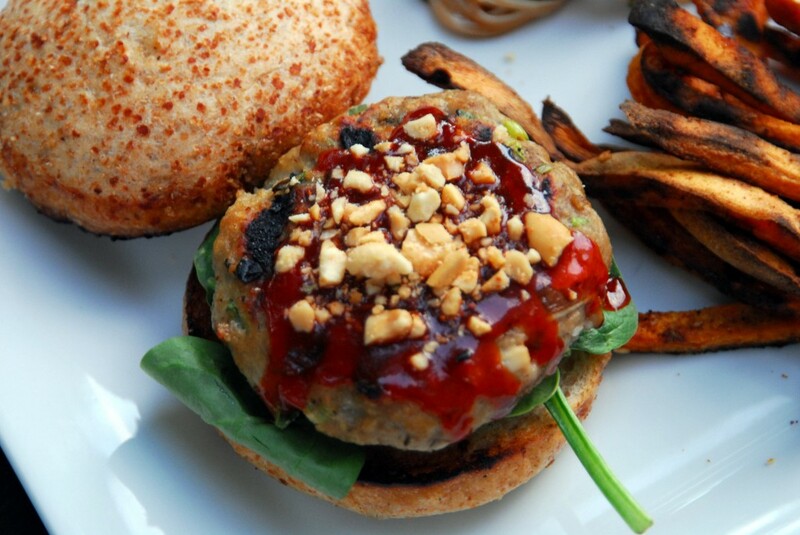 Serve on a toasted bun with spinach and go-chu-jang sauce and enjoy! 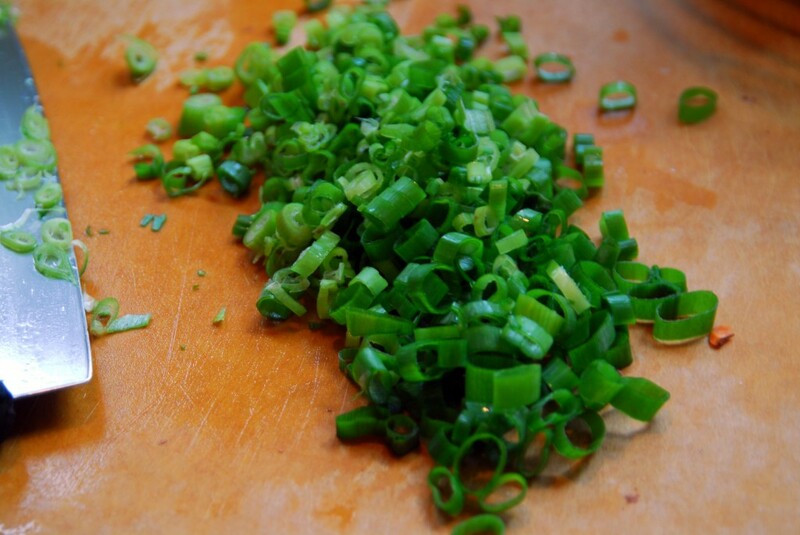 Slice up your scallions and mushrooms and mince your garlic. Add the sesame oil to skillet over medium heat and add the mushrooms. Saute over medium heat for 2 minutes. Add the garlic and saute for an additional minute, stirring constantly. In a large bowl, add the ground turkey, egg, scallions, mushrooms, garlic, breadcrumbs, fish sauce, soy sauce, lime juice, ginger and salt and stir to combine. Heat an oiled grill pan or grill to medium high heat. Form the turkey burgers with your hands and add them to the grill pan (this should make about 5 burgers, depending on how big or small you mold them). Cook for about 5 minutes per side until the burgers are cooked through. Serve on a toasted bun with spinach and go-chu-jang sauce instead of ketchup. Add any other condiments that you like, but trust me, the go-chu-jang sauce really makes the burger! If you like them, crushed peanuts are a great topping too! This entry was posted in Asian, Recipes and tagged asian, burgers, grilling, turkey. Bookmark the permalink. Those look amazing! I always love a twist on the standard turkey burger! Hope you had a great Fourth! Danielle @ Clean Food Creative Fitness recently posted..Fourth of July Recap! 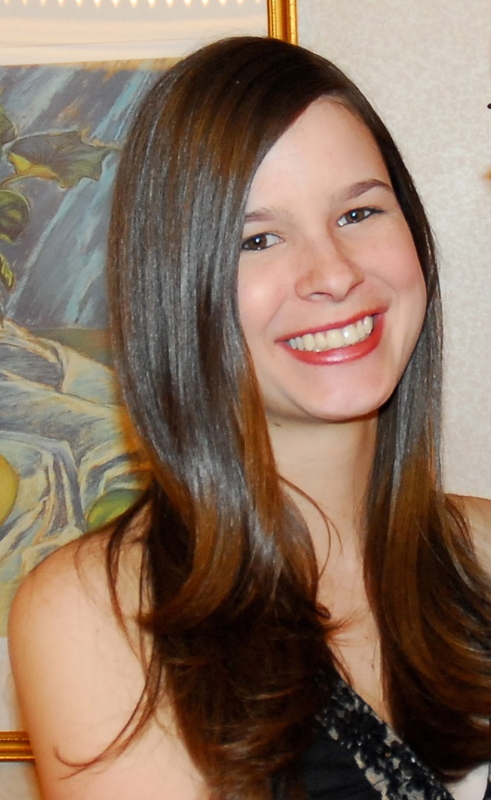 You have some of the most creative ideas ever – I’m so jealous. I’m also jealous that chickpea burgers aren’t as easy to customize. The combo looks SO savory and juicy! You should try experimenting with eggplant burgers – I think they’re easier to add flavors into than chickpea burgers. I love switching it up with different kinds of burgers! And I agree, veggie burgers are wonderful! What a fun twist on a burger. I will definitely be trying these out. Ooh.. that’s an interesting twist. I like it!! We are loving our new grill and will take any excuse to use it. Lol. Oh no way! You eat gochoojang?!? Awesome :). I did a post on Asian pantry 101, and it def make the list hehe. These burgers look great! I’m really into buffalo burgers these days! Have you tried them? SO hearty and satisfying! I’m obsessed with it now! It makes everything better 🙂 And I think I tried a buffalo burger once, but I don’t remember it and need to try one again. Yum! I love anything made with sesame oil. A little goes such a long way, and the smell is out-of-this-world. I bet the mushrooms add a lot of great flavor too! I know – sesame oil is the best for anything Asian! 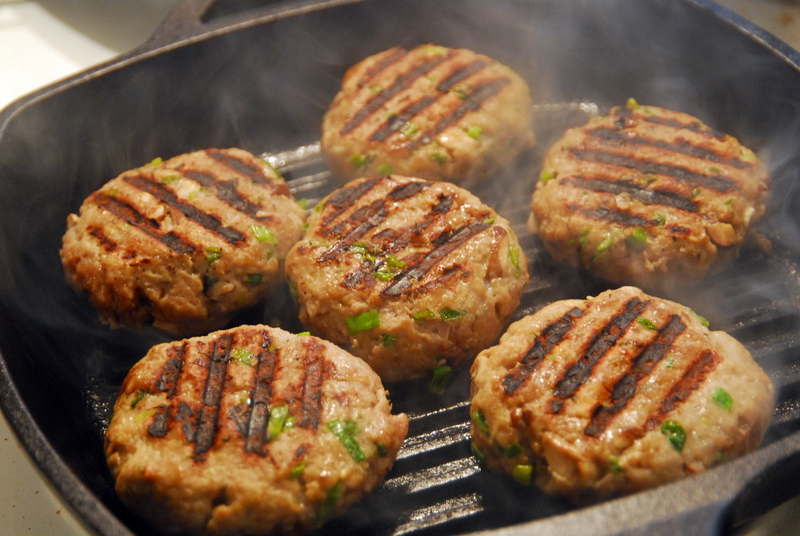 Those are quite possibly the most perfect-looking turkey burgers I’ve ever seen. They look so delicious, and I’m loving the addition of gochujang sauce! Thanks! And the sauce really does make the burger!